Dr. Ashish Sahai, a world leading spine surgeon, is a board-certified orthopedic surgeon specializing in spinal surgery practicing in both Broward and Palm Beach county. 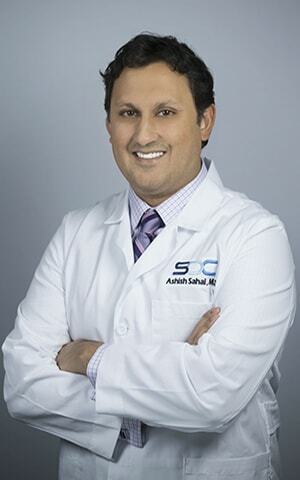 In recent years, Dr, Sahai has captured the attention of the entire medical field through his contributions with improved spine surgery techniques. Drawing on his biomedical engineering training as well as his medical experience from Stanford University, Dr. Sahai holds several patents for spinal implants and also is a consultant with several spine surgery device companies to design new techniques and implants. With his experience he teaches other surgeons, both nationally and internationally, and works closely with area hospitals, handling everything from the routine to highly complex spinal surgery cases. The Spine and Orthopedic Center was founded by Dr. Sahai with the intention of combining cutting edge technology with multidisciplinary specialty physicians to supply patients with a comprehensive center that provides the very best outcomes. Dr. Sahai’s mission is to provide superior quality care, personalized service, and education to his patients so they can confidently make informed decisions about their treatment plan and lifelong wellness. SOC is fully equipped for diagnosing and treating severely debilitating spinal problems, including a high-field MRI, digital X-ray and fluoro technology, a state accredited sedation procedure suite, and an onsite CLIA & COLA accredited laboratory. This allows Dr. Sahai and his team to successfully handle almost any type of spinal condition and treat it accordingly. Due to the sedation being offered in the office, procedures such as kyphoplasty (cement) for compression fractures, radiofrequency ablation (RFA) for neck and back pain as well as epidurals can now be performed on a comfortable, immediate and outpatient basis. Dr Sahai specializes in minimally-invasive spine surgery — a less invasive way to approach spine surgery with less blood loss, shorter hospital stay and faster recovery times. Given his extensive experience, he also handles significant cervical related issues from non-operative care to motion-preservation neck surgery and complex cervical reconstructions. Also because he is a staff surgeon at local trauma centers, he handles spine trauma, revision spine surgery, tumor-related spinal conditions and scoliosis surgery. Castle Connolly Top Orthopaedic Surgeon 2015, 2016, 2017, 2018 – The nomination is decided among specialists in the field. Castle Connolly is the most trusted source of physicians information in the nation. Becker’s “30 Spine Surgeon Influencers – Becker’s Spine Review is brought by Becker’s Healthcare which is the leading source of business and legal information for healthcare industry leaders. 2018 award for exemplary caring doctor by West Boca Medical Center. 2010, 2012, 2013, 2015, 2016, 2017, 2018 recognition by Vitals.com. 2008, 2009, 2010, 2011, 2012, 2013, 2016, 2017, 2018 choice award by Vitals.com. Award given by Healthgrades.com for outstanding physicians. I was born and raised in Webster City, a rural town in central Iowa. I also attended the local high school. I went to the University of Iowa for undergrad, where I completed a Biomedical Engineering degree. Medical school was also at the University of Iowa so I am most definitely a Hawkeye. I pursued an orthopedic residency at Tufts Medical Center. I subsequently sought advanced fellowship training in spine surgery at Stanford University where I stayed for another year in a teaching capacity. Why did you move to South Florida? My wife grew up locally in Coral Springs and wanted to return. My motto on life is “Happy wife, happy life” so here we are. We met when I was on a rotation at the University of Miami as a medical student and she was an undergraduate student at the University of Florida (I know she’s a Gator but I married her anyway). Why did you choose to become a spine surgeon? I want to improve the quality of life for people who suffer from acute to chronic back problems. I want to provide high quality genuine care which is research based and has predictable options of treatment. I was interested in the anatomy of the brain and spine even as a medical student. After I chose orthopedic surgery, a spine specialty seemed a natural progression. Treating the spine both operatively and non-operatively is difficult but a challenge I look forward to because the difference it makes in a person’s life. They become free of pain and enjoy life the way it was meant to be enjoyed. What do you enjoy doing outside of work Dr. Sahai? I enjoy most sports activities especially skiing/snowboarding. I also picked up surfing a little while in California. I enjoy music as well — I have played the piano for 14 years but lately it has been more sporadic in nature. I previously had a pilot’s license but unfortunately it expired during my training as I did not have the time to maintain it. I travel as much as possible to different places. I have traveled throughout most of Europe, and parts of Asia so far. Most recently, I was in Australia and New Zealand. It’s always interesting to learn about different cultures.